Brand new PATH PA-5 train passing a New Jersey Transit multilevel consist at Harrison Station. Photo by Richard Panse, July 2010. The PATH system has a long history which actually precedes the IRT. 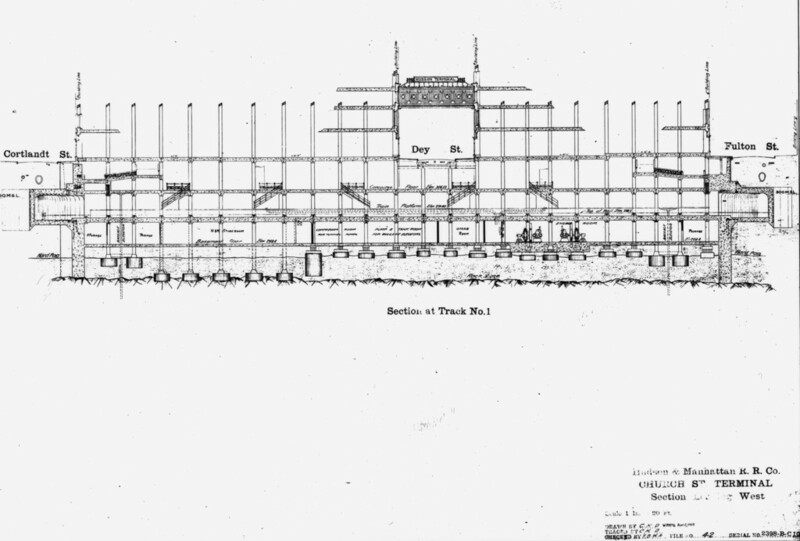 In 1874 Dewitt Clinton Haskins raised sufficient funds and built more than 1000 feet of tunnel under the Hudson. He was forced to abandon work after an accident which resulted in the loss of 20 workers. 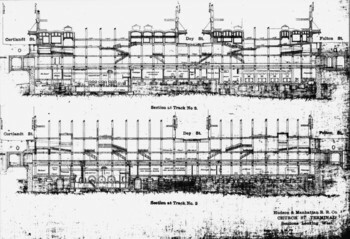 In 1890 a new attempt was made with estimated completion in 1895. Money trouble soon caused the failure of this attempt. It was not until after 1900 that William Gibbs McAdoo and Charles Jacobs resumed work on the tunnel. 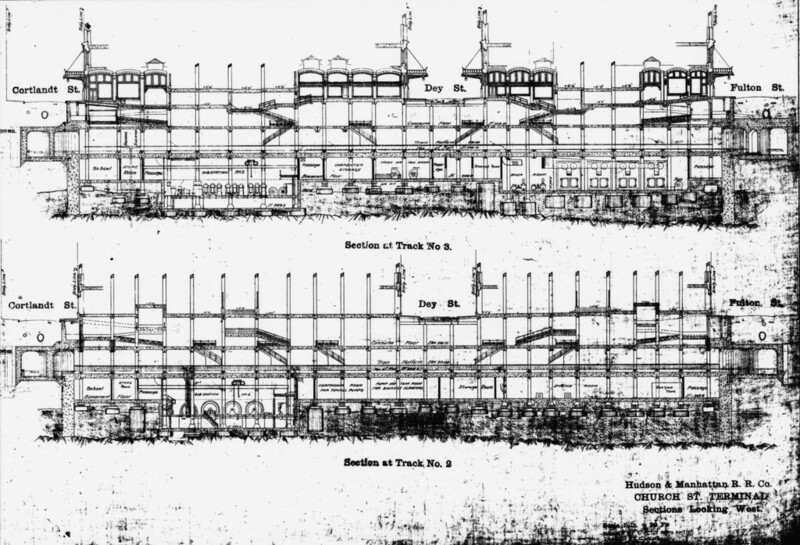 They even planned an ambitious expansion of the original plans; their system would connect New York City with not just Jersey City but also Newark and Hoboken, and then to Herald Square in New York. The first test train ran in December of 1907. The first rolling stock was manufactured by Pressed Steel and American Car and Foundry (ACF)-both companies also supplying many cars for New York's system until the companies ceased operations. Stillwell designed ACF's car which was 48 feet long, 8.5 feet wide and weighed 64,000 pounds. The cars differed from IRT cars in their having curved windows at the sides, along the doors and in the middle. 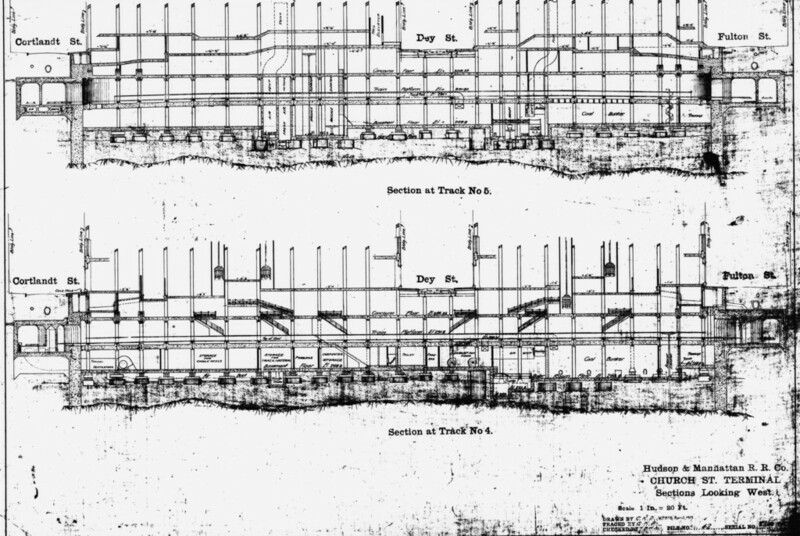 Test trains were operated starting in January, 1908, and on February 25, 1908, the first passenger train was operated from 19th Street to Hoboken. A telegraph message from the station to President Theodore Roosevelt was sent, and Roosevelt pressed a button which was linked to the Tubes power station. The station turned on the electricity and service began. The Newark extension was opened in 1911 (later moved to Newark Penn Station in 1935) as well as the Exchange Place area. McAdoo tried to have the line extended to Grand Central and Astor Place IRT was but not successful. After the depression, ridership declined and the Lincoln and Holland Tunnels lead to a further decline in riders. In the 1950's the H&M system fell into bankruptcy. In the 1960s, the Port of New York Authority agreed to buy and run the lines in return for the rights to build the World Trade Center towers in the land then occupied by the H&M's Hudson Terminal buildings. One of the PA's first actions, other than removing the H&M name from the system, was to order new cars to replace the old ones, some of which dated back to the original order. More cars were added in 1972 and later in 1988-1989. The fleet was replaced again in the timeframe 2008-2011. Despite numerous tight curves, the H&M/PATH system's safety record has been exceptional. Probably the most significant accident took place in 1942, in which a train operator exceeded the 12mph speed entering Exchange Place Station. Survivors say the train was running at maximum speed, possibly 40-60 MPH. The lead car demolished signals, third rail sections and caught fire. The third car telescoped into the second and climbed towards the platform and crashed into the walls. The fourth car actually ran up onto the platform, the trucks having been ripped of by the force of the impact. Five died in the accident. The operator was indicted with five counts of manslaughter and one of operating a train under the influence of alcohol. Stan Fischler's book The Subway has more information and a photograph on pages 134-136. In recent years, the system has been shut down for various occurances. A flood in the early 1990s suspended service on the uptown lines for a few weeks, and in 1993, the bombing of the World Trade Center required suspension of WTC service for a week. The WTC station was heavily damaged in the bombing. The renovation of the station due to the damage from the 1993 bombing was still not complete on September 11, 2001 when the station was totally destroyed. Work Fleet (as of 1/1/1997) 12 flat cars, 31 work cars, 3 ballast cars, 2 snow plows, crane car, snow broom car, tamper, high rail car, "rerail equipment car"
Medal "Commemorating the opening of the Hudson River Tunnel connecting Jersey City-New York." Collection of C. K. Leverett. Newark Penn Station. The PATH service is on two levels, with the Newark-bound service terminating on the upper level "Platform H". Ramps and stairways connect the upper platform to the southbound platforms of the Amtrak/New Jersey Transit level (platforms 3, 4, and 5). The lower level hosts New York-bound service and is a single track with platforms (Platform B and Platform C) on each side. These platforms physically share an island platform with track 1 and 2 respectively of the Amtrak and New Jersey Transit main line. The fare control runs down the middle of the platforms. During peak times, doors on both sides of the train open. From the lower level, there is access to the street via stairs, escalators, and elevators. Express train indication lights have been incorporated in a sign array which also indicates train departing. Leaving the station heading east, Track 1 (to New York) climbs to the level of track 2 and together they cross the Passaic River on the upper level of "Dock" drawbridge before descending back to grade. Harrison. Harrison is located just across the Passaic River from Newark and the bridge crossing gives a postcard view of the NJ Performing Arts Center and downtown Newark. The station has two side platforms. In between the PATH service tracks there are three center tracks used by the Northeast Corridor (New Jersey Transit and Amtrak). The canopy is short with an extra bus shelter on the east end of the eastbound platform. At the west end of this platform is a brick platform level fare control and waiting room. There is no crossunder or crossover. For many years, the ride from Harrison to Newark was free. The fare control area was opened only during construction related wrong-rail operations. Harrison Station is due for a total renovation starting in 2012. Harrison Maintenance Facility. Departing Harrison eastward, the main yard and shops of the PATH system is on the right hand side. This facility replaced the old H&M Grove/Henderson Shops (closed on October 12, 1990), which were located near Grove St. station. The tracks from here northward are at grade level, first paralleling the Northeast Corridor and New Jersey Transit's Morris & Essex line, then the PATH tracks peel away to the east and run through the Conrail Shared Assets Kearny intermodal facility. This is a long straight flat sections and the PATH trains get their most speed in this area. The former PRR heritage of the line is evident by the catenary poles and de-energized wire still over the tracks in this area. Then, we ascend on a concrete structure toward the Hack drawbridge. After the drawbridge, the line passes through an industrial-warehouse district. One of the local streets in the area, West Side Avenue, used to cross the PATH right of way at a grade crossing but this has since been severed. A pedestrian bridge over the tracks marks the location of this former popular photo location. Finally the tracks enter a wide, shallow rock cut. Journal Square. Approaching Journal Square station, trains first pass the site of a small yard between the service tracks just west of the station. Crossovers allow any train two run on any of the four tracks and two island platforms at Journal Square. The station has a high ceiling in sections and a mezzanine level connecting the platforms. On the upper level are shops and bus lanes. The PATH Command Center is at the west end of the westbound island platform. From here, all trains are monitored. Under normal operations, the "local" tracks are used by Newark/WTC trains while the inside "express" are used by Journal Sq./33rd St. trains. The Journal Square station was completely rebuilt when the PATH took over for the Hudson & Manhattan as part of the World Trade Center construction deal in the late 1960's-early 1970s. Leaving the station to the east, we are in a deep cut trench, sharing right of way with a Conrail Shared Assets freight track. Another small yard is to the south, and then we approach the tunnel portal. Grove Street. Originally named "Grove/Henderson Sts." This first underground station has two tracks with a single island platform. The subway portion from west of Grove St. to Exchange Place runs under a street formerly named "Railroad Ave." (now named Christopher Columbus Drive). Above Railroad Avenue ran a four-track viaduct for the Pennsylvania Railroad, which lead to its Exchange Place waterfront terminal. 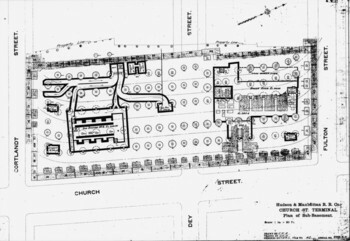 Grove St. station originally had entrances at the extreme east and west ends of the platforms. The western end, leading to Grove Street and Newark Ave. had a long escalator ending in a headhouse at street level, underneath the Pennsylvania Railroad viaduct. Fare control was inside the headhouse. The eastern end, leading to Henderson Street, consisted of a long corridor leading to escalators to the surface under the railroad viaduct. Fare control at the eastern end was in the platform-level corridor. After the demolition of the PRR viaduct, the station was reconfigured as part of the Port Authority's mid-1970s improvement projects (which included the Journal Square Transportation Center). The eastern and western exits were closed in favor of a mezzanine slightly to the east of the intersection of Grove St., and Christopher Columbus Drive. Two stairways from the platform connect to the mezzanine, with fare control barriers at the top of each stairway. 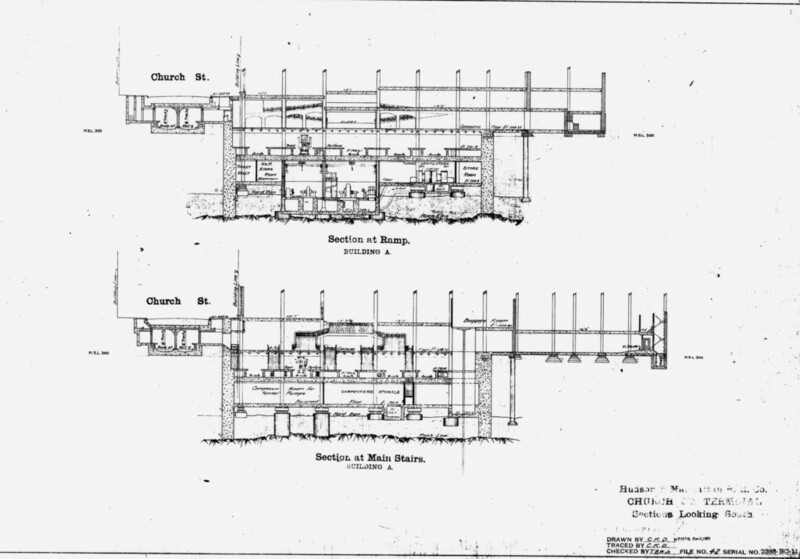 The mezzanine itself has two exits to the street, one with stairs only, leading to the southeast corner of Christopher Columbus Drive and Grove Street, and one with escalators coming up into a structure in Fitzgerald-Holota Park, located in the triangle formed by Columbus Drive, Grove Street, and Newark Avenue. Following the destruction of the World Trade Center on September 11, 2001, and the forced closure of Exchange Place Station, the Port Authority anticipated a 75 percent increase in passenger use at Grove Street as it was then the closest PATH station to Jersey City's Exchange Place and Harborside business district. It approved a $14.6 million plan to lengthen the station and to reopen the former eastern entrance, at Marin Blvd. and Christopher Columbus Drive. On June 29, 2003, PATH service was restored to Exchange Place, and since that time it appears that the lengthening project at Grove Street was abandoned. However, the eastern entrance to Grove Street was finally reopened on May 15, 2005, almost two years after the reopening of Exchange Place station. The platform area has a brown tile floor, and walls painted in a black, blue, white scheme, with "PATH" logos stenciled on a center stripe. The thick columns are tile around cast iron, the plain iron tops of which are painted powder blue. Leaving Grove Street we come to the interlocking which allows trains to head to Hoboken/Midtown or the World Trade Center. Exchange Place. 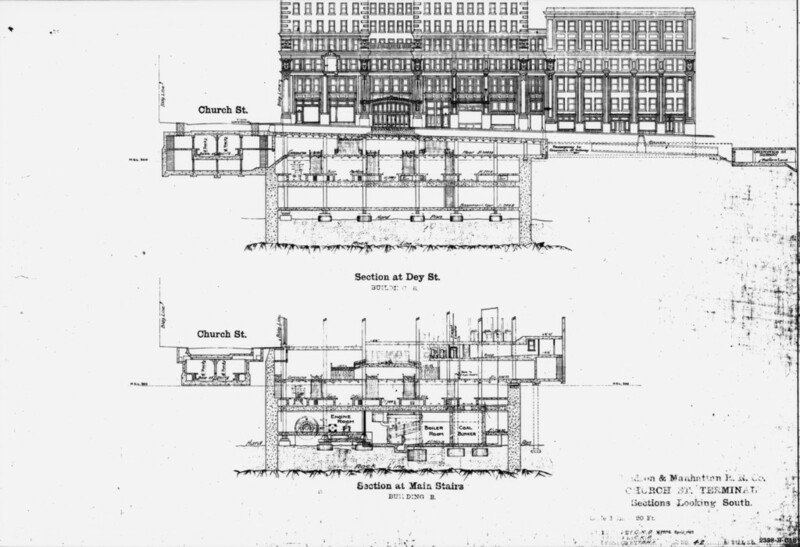 Another station that has seen some changes over the years due to fluctuating passenger volume, the Exchange Place station was built underneath the Pennsylvania Railroad's waterfront terminal. The name itself refers to the fact that railroad passengers heading to New York City must change from the PRR's steam (later electric) trains to ferries or the "tube" trains to Manhattan. 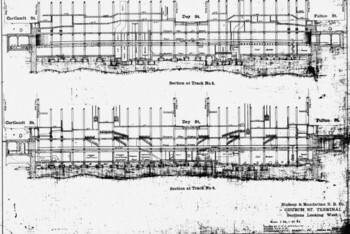 In 1910, the tunnel to Pennsylvania Station opened, eventually rendering the PRR's Exchange Place terminal mostly useless with only short-haul local trains terminating here. The PRR station closed in the 1960s. Access to the station used to be provided solely by elevators in two banks, the existing group at the west end of the station and the other, primary bank at the easternmost end of the station (in an area between the platforms which is now closed off by ventilation grating). The easternmost elevators led directly into the old PRR terminal and were closed when the PRR closed its Exchange Place terminal. The westernmost elevators were rebuilt in the 1960s, the old hydraulic manual units replaced by automatic cars in the old shafts. In the late 1980s, the current escalator shaft was constructed, and then the west elevators were replaced again in the early 1990s. The street side saw two new headhouse structures constructed; one free-standing at the top of the escalator shaft, and one built into the side of the "Exchange Place" office tower. The platform area has also been renovated in the recent past. The walls and floors are tiled and the ceiling is arched with transverse metal slats. The platform design in use prior to September 11, 2001, allowed only 7 cars to open heading east, but all 8 heading west. At this station the conductor operated at the rear of the first car allowing the first car to remain closed at the eastbound platform. As a point of trivia, one of the only remaining vestiges of the Hudson & Manhattan lay along the platforms at Exchange Place: manhole covers still indicate the ownership of the "H&MRR". After the 2001 World Trade Center attack and resulting closure of the station at WTC, Exchange Place station became orphaned. Without the World Trade Center loop there was no way to turn trains at Exchange Place so the station was closed. The tunnel mouths were "plugged" to prevent any flooding that might occur if the World Trade Center "bathtub" were to breach. 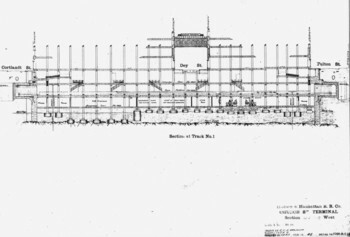 Construction began in late 2001 to rearrange the tunnels approaching Exchange Place to allow for installation of a crossover, as well as to permit 10 car trains to platform. The work was part of a $566 million project to restore PATH service to lower Manhattan; the cost of restoring and expanding Exchange Place station was $160 million. The Exchange Place project was completed in 21 months, and the station was opened as PATH's new temporary stub terminal on June 29, 2003. PATH service resumed to the World Trade Center on November 23, 2003. World Trade Center. Following the 2001 terrorist attacks and demolition of the World Trade Center, the Port Authority began a $566 million construction project intended to restore PATH service to lower Manhattan. The PA's contractors, the same firms who restored the 1 and 9 lines for MTA, repaired the tunnels and installed 7,000 feet of new continuously-welded track. On November 23, 2003, PATH opened the new, $253 million temporary station. The track layout serving the station is installed in the same loop configuration as the previous World Trade Center station's tracks. Passengers will find a sparse, utilitarian station without amenities; however, they will find their ride smoother, thanks to the new track. The station has five tracks and three platforms. Track 1 is served by a wall platform (in the past was typically used only for passenger discharge in the morning rush). Tracks 2 and 3, typically serving Hoboken-bound trains, share an island platform, as do tracks 4 and 5, typically serving Newark trains. On weekends and late nights service is typically operated from one platform or the other. Each platform is served by several stairways to the mezzanine, and an elevator is located at the tail (south) end of the each platform. The fare control mezzanine is bright and airy. Exiting the station is done via a short stairway from the mezzanine to an intermediate level, and then via a full array of long escalators to an upper level mezzanine. From here direct connection to the Cortlandt Street station of BMT Broadway Line and the Chambers Street station of the IND 8th Avenue/Fulton Street/Rockaway Line. In fact, the entryway to the Chambers Street station reuses the same passageway and marble flooring of the former entry from the World Trade Center mall. Planning is underway for a new $2 billion PATH terminal with transfer passageways to the various lower Manhattan subway lines. See the photo gallery below for some photos of the original construction of the World Trade Center. Hoboken. Underneath New Jersey Transit's Hoboken Terminal (technically, the station lies mostly underneath the bus depot on the north side of the terminal), this station has three tracks, with one side platform and two island platforms (configuration, north to south: track-platform-track-platform-track-platform). There are two major exits from the station complex. The easternmost exit has stairs and a passageway leading directly to the NJT portion of Hoboken Terminal, and there is also a stairway directly to the street. There is also an elevator leading to the street with a ramp to re-enter Hoboken Terminal. The westernmost exit consists of a mezzanine over the tracks and platforms, with exits to the Hoboken streets as well as directly into Hoboken Terminal adjacent to Track #1. Trains departing Hoboken quickly come to a junction allowing a choice of destinations: 33rd Street or Newport (and thence to World Trade Center or Journal Square). Christopher Street. The first station in New York City is located in Greenwich Village under Christopher Street between Greenwich and Hudson. It is unusual in that it is named for the street the tracks run under- not a cross street. The station has two tracks and a single island platform. Columns have beige tile and the platform has dark brown floor tile. Ceiling is rounded with metal slats like Exchange Place. Fare control is at platform level at the west (southbound) end. Sources mention a closed fare control or exit at the opposite end. 9th Street. Located under Christopher Street just west of 6th Avenue. The station entrance is on West 9th Street east of 6th Avenue. A corridor snakes along under 6th Avenue and then a flight of stairs leads down to the island platform. The station resembles Christopher Street but the fare control is at the east (northbound) end of the platform. Trains departing 9th Street northbound take a sharp left-hand curve to place them under 6th Avenue. 14th Street. Two side platforms. The 6th Ave. IND trains are on the other side of the platforms (if the walls were removed the PATH platform would be an island). The IND 6th Ave. Subway express tracks are on a lower level. There is no crossover or crossunder. Exit is near the center of the platform. The southbound PATH service shares a mezzanine area with the IND subway, but the northbound platform's exit is directly to the street. 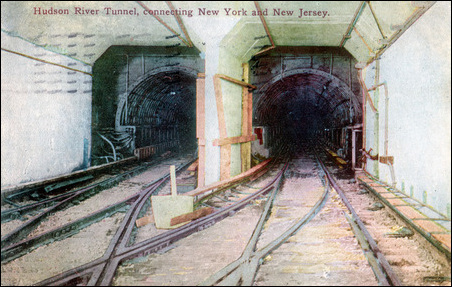 A postcard view of a crossover in the H&M tubes. Full crossovers were located just west of Grove Street and just north of the former 19th St. station (since removed). The postcard likely depicts the one near 19th Street. 19th Street. This station was closed in 1954 to help speed service. The platform space is now used for electrical and ventilation equipment and can be easily seen from passing trains. 23rd Street. Two side platforms. The exit is at the center of the platforms, but one must go down one level to cross under the IND subway. The fare control is in this underpass. The entrance is shared with the IND mezzanines on each side. 28th Street. A second closed station, but this time, only traces remain. (Look for the arches in the tunnel ceiling.) 28th St. was closed when 33rd Street station was relocated southward as part of the IND 6th Avenue subway construction in the late 1930s. 33rd Street. Actually located between 30th and 32nd Sts., this station was further north but was rebuilt at its current location when the 6th Ave. IND subway was built. There are three tracks, with two side and two island platforms. The side platforms are used for discharging passengers only and for many years, did not have fare control equipment. The island platforms are typically used to board trains for Journal Square (eastern platform) and Hoboken (western platform) with the middle track typically, but not always, serving additional Journal Square trains. Red letter mosaics to 30th Street and to 34th Street are on the white tiles side walls which are at the ends of the station which also has some beige wall tile and some cinder block. The northern end of the platforms slope upward leading to the Manhattan Mall and passageway to the subway. 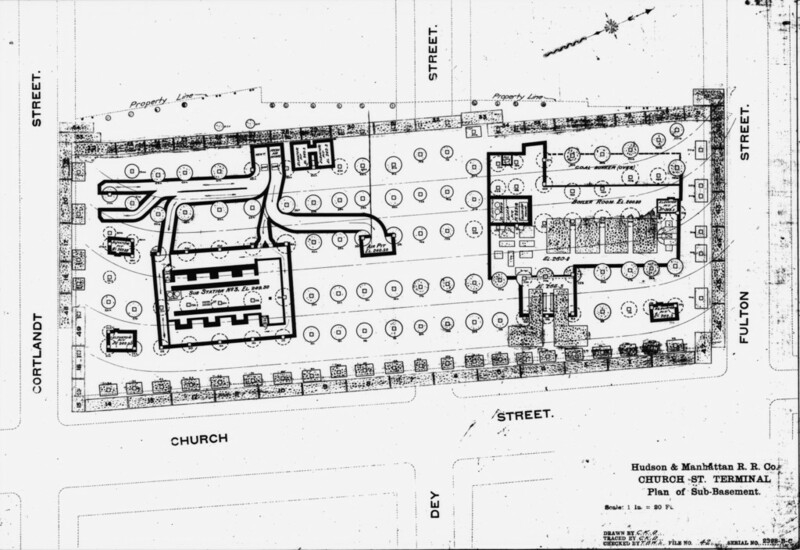 Some relative depths of stations in the 34th St./6th Ave. complex are as follows, +/- 10 feet. The station at Pavonia/Newport is served by trains on the Hoboken-World Trade Center and Journal Square-33rd Street routes. This station is of unusual configuration: two tracks, one island and one side platform. The island platform is narrower than other island platforms in the system and has a fairly low, arched ceiling. A number of stairways from the island platform lead to a mezzanine level. The narrow platform, low ceiling, and many stairways lead to a claustrophobic feeling in this station especially during rush hours. The station has undergone major changes over the years, due to changing passenger patterns. Originally named "Erie", this station was built to service the Erie Railroad's waterfront terminal at this location. Built with only the island platform, the side platform was added around 1914 to handle the passenger loads heading to the Erie terminal. It was closed in 1954 to save the bankrupt H&M some money, and shortly thereafter the Erie Railroad ceased passenger operations at this location. The side platform was to remain dormant for nearly 50 years. The northernmost stairway exit from the two platforms lead to a steep passageway which originally lead directly to the Erie Railroad terminal. This passageway was the site of the first "travelator" installation in America (it has long been removed). In the 1920s a second passageway and mezzanine area was built over the existing platforms and northbound trackway. This second passageway and mezzanine area was also closed in 1954, but was reopened in the late 1980s/early 1990s after the station was renovated. This renovation also included work on the side platform, as detailed below. The area above the station has changed quite a bit since the Erie Railroad shifted all of its operations to Hoboken in the 1960s. Between that time and the late 1980s, Pavonia/Newport station was the least used in the system. Closed at nights and on weekends, no major roads led to the station and it was essentially isolated. Today, however, no trace of the old railyards remain, and the area around the station is spearheading the Jersey City waterfront revival. A large shopping mall (Newport Centre), numerous high-rise apartment towers, and office buildings have sprung up with even more under construction at the time of this writing. The station is no longer the least used in the system; it is again open 24 hours and has seen the largest percent gain in passenger fares paid per year for each of the past several years. The late 1980s renovation of the station installed brighter lighting and new multi-colored wall and floor tile, artwork in the passageways, and elevators between the lower mezzanine and the island platform, and between the upper mezzanine and the street. 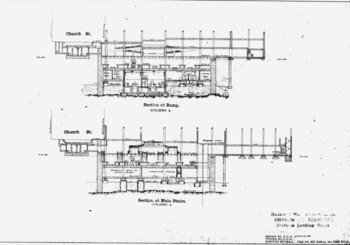 (The two mezzanines are still connected by the long sloping passageways described above.) The Erie Railroad legacy is still present in the "E"'s engraved on the tops of the columns along the island platform. To alleviate crowding on the claustrophobic center platform, the spare side platform was renovated and opened to passenger traffic in August, 2003. The 2003 renovation included the installation of a new elevator and another stairway to the mezzanine. During daytime and evening hours, trains bound for Hoboken and 33rd Street open up on the side platform. The center platform is used for Exchange Place and Journal Square-bound trains during the daytime and evening, and for all trains during the overnight hours. No doubt the Pavonia/Newport station will continue to be used heavily. More surface construction (including several office buildings and two hotels) will add yet more passenger volume. 501-520 J American Car & Foundry 1928 Preserved: 503 (Shore Line Trolley Museum), 510 and 513 (Trolley Museum of New York). 1961-1972 MP-38 American Car & Foundry 1927 PRR owner-see note below. "MP"-class cars were owned by the Pennsylvania Railroad and used in the H&M/PRR Joint Service between Hudson Terminal and Newark. The service was jointly operated from 1911 to 1961. Notes on rebuilt "Black" cars: Coincident with the deliveries of the 50 MP41/K cars, H&M did a mini-rehab to some cars, ranging from simple new flooring installation, new doors and metal-framed window sash to installing an air-conditioning unit at the end of one car (439) and completely new sides with elliptical window casings to one car (407). Some had updated lighting. In 1962, after PATH took over service, six of these cars were painted blue and kept together as a single train, ostensibly to garner passenger opinion toward spec'ing a new fleet. This train ran intact until 1966--principally in Hudson Terminal/Journal Square service--when new PA-1s bumped then into work service, where at least four of them, including 407 and unrebuilt 501, lasted for at least another 10 years. The "Blue Train" consisted of cars 501 (unrebuilt)-472-407 (new sides and window treatments)-516-438-439 (a/c). Except for 501, which retained its double-pane doors (like the IRT), all had square single-pane door windows and single-sash end door windows. 439 was kept at one end of the train as its air-conditioning unit occupied what was a vestibule doorway. Other cars which got rebuilt included 408, 445, 447, 502 and 511. They were mixed indiscriminately in trains consisting of other classes of "Black Fleet" cars. Ultimately, all of the rebuilt cars, including 407, were scrapped. Peter Ehrlich. MP51/K-class cars 1200, 1201, 1202, 1230, 1231, 1233 sold to SEPTA for their trucks; installed under Market-Frankford "Almond Joy" cars for use on the standard-guage Norristown Line; car bodies sunk near Point Pleasant, NJ to create an artificial fishing reef. MP51/K-class cars 1211, 1213, 1228 involved in an accident involving a PRR diesel switcher near Harrison on 7/24/1963 (2 fatalities, 28 injuries). Cars scrapped. MP51/K-class cars 1237, 1238 converted into motorized flat cars. 600-709 PA-1 St. Louis Car Co. 1965 "A" cars - cabs at one end. PA-1, PA-2, and PA-3 class cars are 51'8", painted aluminum bodies, two doors per side. PA-4 class cars are 51'8", stainless steel bodies, three doors per side. The train abandoned at the World Trade Center on 9/11/2001 consisted of cars: 845, 139, 143, 612, 750, 160, 745. They were removed by truck/barge to Staten Island for decontamination and stripped of usuable parts. Since then, 143 and 745 were moved to the storage hangar at JFK Airport where WTC debris is being examined. Photo by: Ed Davis, Sr. PATH Signals. A description of the signal indications you might see along the PATH (although new CBTC cab signalling is being introduced from 2012 onward). Old PATH/H and M Signal Aspects. Another description of old PATH/H and M signal aspects. 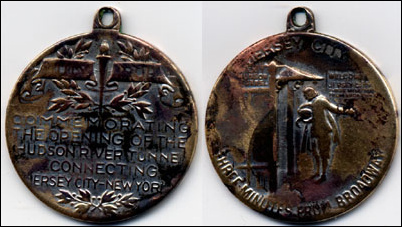 Hudson and Manhattan Railroad Tokens. Tokens formerly used on the Hudson and Manhattan/PATH system. Official Site - The Port Authority of New York and New Jersey. The official site of the Port Authority has information about the PATH, including fares, schedules, and more. By Peggy Darlington. Route Map by Michael Calcagno. Track Map by David Pirmann.